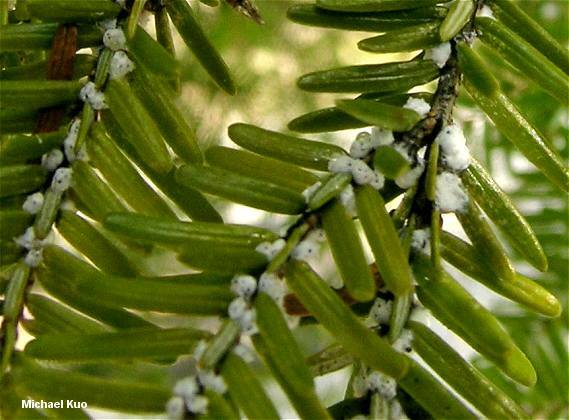 The Woolly Adelgid, an Asian insect, currently threatens the eastern Hemlock throughout much of its range. Attempts to control the woolly adelgid have not been successful, and some experts predict a disaster on the scale of the chestnut blight that wiped out the American chestnut. 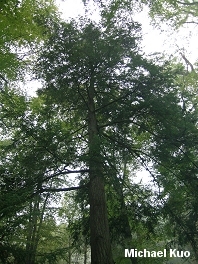 The adelgid can be seen, covered with white "wool," at the needle bases of infected trees (illustration to the right). 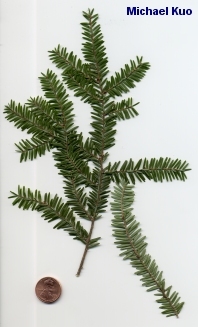 Dark green, short, flattened needles that are grooved; cones small; bark dark and furrowed; growing in northeastern North America. Habitat: Sometimes in pure stands but usually mixed with other species in northern hardwood forests and Appalachian forests. 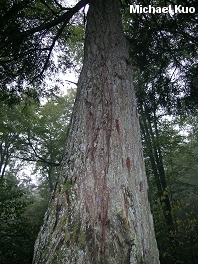 Stature: 60-70 feet high; to 3 feet in diameter; pyramid-shaped; branches horizontal. Needles: Less than 1 inch long; dark green to dark yellow-green; flattened; grooved above. Bark: Scaly when young, later deeply furrowed; dark gray to dark reddish gray. 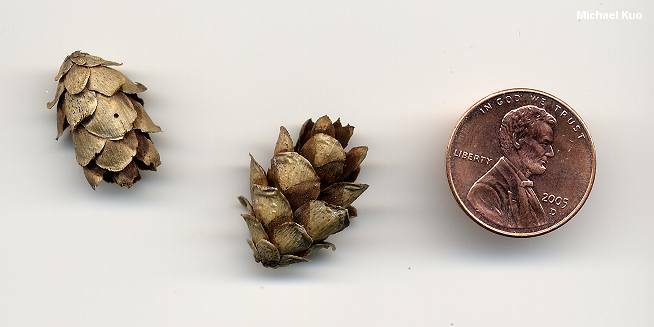 Cones: Under 1 inch; scales with smooth edges. Albatrellus caeruleoporus; Amanita ceciliae; Amanita porphyria; Austroboletus gracilis; many species of Boletus (including Boletus badius, Boletus inedulis, and Boletus parasiticus); Ganoderma tsugae (named, obviously, for its association with hemlock); Hydnellum aurantiacum; Lactarius affinis var. viridilactis; Lactarius subpurpureus; Phellodon alboniger; Russula xerameplina; many species of Suillus; Tricholomopsis decora; and many others.